Charles Sabino provided these photos of the dedication of the USS Birmingham (SSN-695) sail at the DSCC Land and Maritime Command Weapons Park on Wednesday, September 23, 2015. Several members of the Columbus Base of USSVI were also in attendance. Additional photos of this event are posted in the gallery and can be viewed by either clicking on the thumbnail to the left or "Photo Gallery" tab in the main menu. 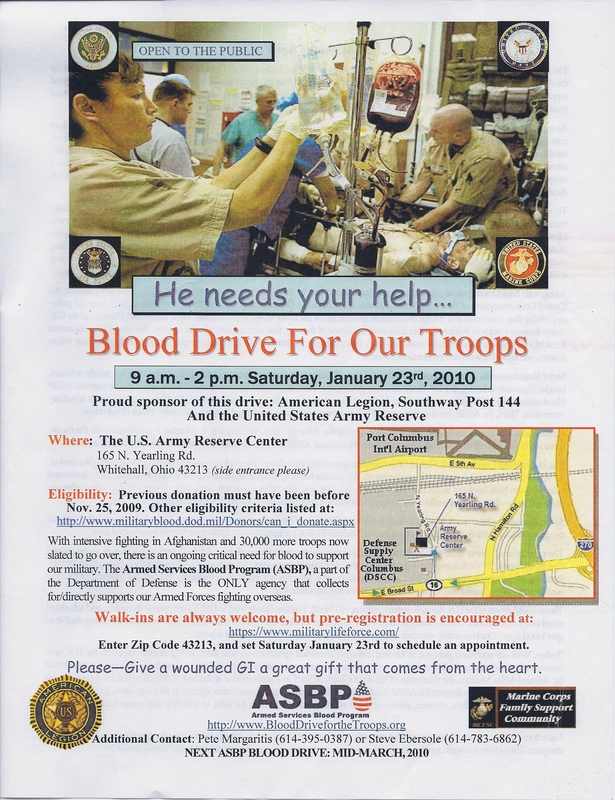 Special Blood Drive For Our Troops, Armed Services Blood Program (ASBP) Saturday, January 23rd 0900 to 1400 at The U.S. Army Reserve Center, 165 N. Yearling Rd. Whitehall, Ohio 43213 (side entrance). The Global War on Terror continues. With escalated enemy operations in Afghanistan, there is an ongoing critical need for blood to support our Armed Forces. Blood collected will be in-theatre in 3-4 days Click graphic to view full details and map. 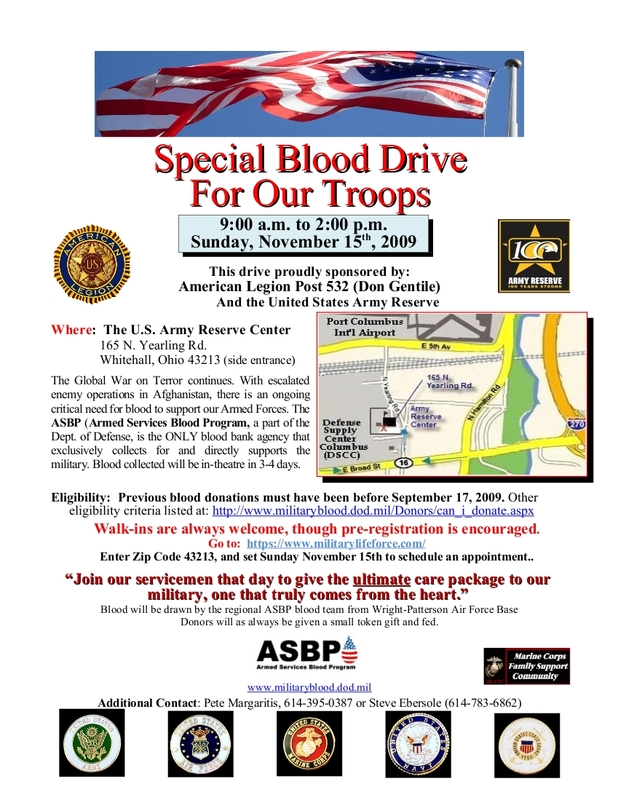 Special Blood Drive For Our Troops, Armed Services Blood Program (ASBP) Sunday, November 15th 0900 to 1400 at The U.S. Army Reserve Center, 165 N. Yearling Rd. Whitehall, Ohio 43213 (side entrance). The Global War on Terror continues. With escalated enemy operations in Afghanistan, there is an ongoing critical need for blood to support our Armed Forces. Blood collected will be in-theatre in 3-4 days Click graphic to view full details and map. Photos from the 4 April Tolling Ceremony and Submarine Birthday Dinner held at the Don Gentile American Legion Post 3529, 1571 Demorest Road in Columbus are posted in the Photo Gallery. View full album by either Clicking the photo or Photo Gallery in menu at left. A couple of reminders; the CD2 2009 District Convention and Submarine Birthday Ball is being hosted April 23‐26, 2009 in Manitowoc, Wisconsin and the first Columbus Base highway cleanup is scheduled for 18 April, watch calendar for details. Marv's Photos from USS Razorback SS-394 in Little Rock, Arkansas are posted in the Photo Gallery. View full album by Clicking the photo or Clicking Here. Photos from the 17 May Columbus Base Tolling Ceremony held in Columbus City Hall are posted in the Photo Gallery. View full album by either Clicking the photo or Photo Gallery in menu at left. Photos from the 5 April Submarine Service 108'th Birthday Dinner/Meeting held at the Buckeye Lake VFW Post #1388 are posted in the Photo Gallery. If you have additional photos from this event and would like them posted please forward them to one of the base Website admins (Cliff, Jim, Joe, or Woody). View full album by either Clicking the photo or Photo Gallery in menu at left.